Carmen Thyssen-Bornemisza, one of the world's foremost art collectors, now has her own eponymous museum in Malaga, which opened in March 2011. The paintings are from her personal collection, amassed over the past 30 years. 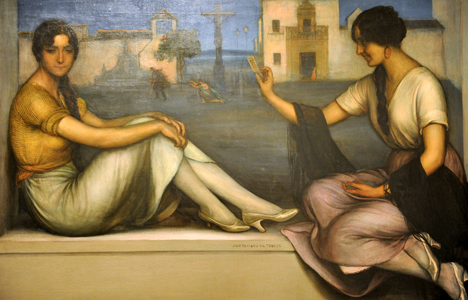 The permanent collection consists of 230 works, mainly by 19th-century Spanish artists, with most of the subject matter being, unsurprisingly, Andalucia: Cordoba, Malaga, Sevilla. The most famous painters whose works feature in this collection are Zurbaran, Sorolla, Zuloaga, and Romero Torres. Fin de Siglio (End of Century). The first section on the ground floor is of particular interest to Andalucia.com readers. You can see many landmarks and scenes (patios, bullrings, processions) which have changed very little in Andalucia. The Baroness herself described the collection, at the museum's inauguration, as "the most essential part of Spanish history. You'll feel what is Andalucia." However, not all of the art is Andalucian, or even Spanish. It become progressively less so in the second and third sections. In the Old Masters one of the most important pieces is a simple 13th-century Italian statue of Christ which is displayed to spectacular effect on a bare white wall. This minimalistic style is striking in that it concentrates your attention on the work, rather than being distracted by elaborate carved or gilted wood, as in most churches; Christ appears exquisitely small and vulnerable. There are also short themed mini-exhibitions with complementary movie screenings and live performances, such as flamenco. Other activities include summer programmes for children, family days, and events related to major local festivals such as Semana Santa and the Malaga Feria. 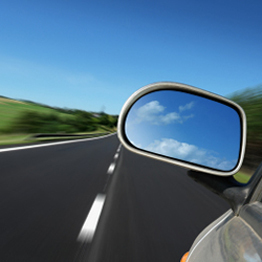 An audio guide is available for a small additional cost. The home of the museum, the Palacio de Villalon is a beautiful 16th-century palace with a traditional colonnaded patio, whose refurbishment cost 20 million euros. There were 158.500 visitors to the Museum in 2016 of which 50.000 were from abroad. 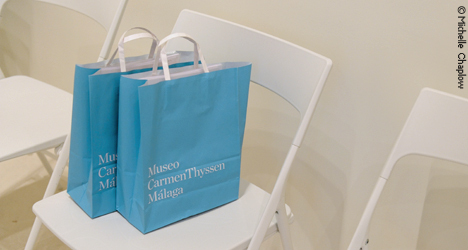 Instant delivery by email of tickets for the Carmen Thyssen Museum, Malaga. Show ticket on smart phone to gain instant access, or print ticket. Skip the line no waiting. Main museum only: 6 euros (over 12 years old); 4.50 euros reduced fee for pensioners, unemployed, students aged under 26. Temporary exhibitions: 4 euros, 2.50 reduced fee (see above). Joint ticket (main museum and temporary exhibition): 9 euros; 4.50 reduced fee (see above).